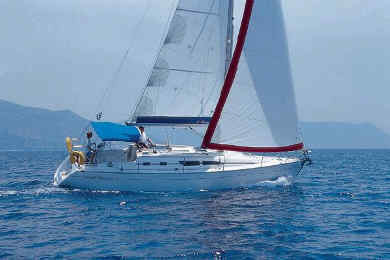 The Sun Odyssey 37 is renowned for outstanding sailing performance, exceptional interior layout and superb build quality. These are some of the features that helped the Sun Odyssey 37 earn Boat Of the Year and Top 10 awards in 2000. The Jeanneau Sun Odyssey 37 has three double cabins, one forward, two aft. There is one head with hot and cold water shower, aft. Additionally, there is a sunshower on deck. The Jeanneau Sun Odyssey 37 has classic slab and roller reefing, one wheel steering and a electric anchor winch. There is a bimini and dodger, an ondeck shower and BBQ,AM/FM radio & CD player, fully equipped galley with LPG stove & oven, fridge/freezer, pre-charter cruising guides, full boat and chart briefing. Optionals include a skipper or a provisioning service.